This morning I got to sleep in until 8:27 am. Total heaven. And, I am sorry to say, seeing the clock flash 8:27am as I opened my eyes was the high point of my day. You see, last night both my children had sleepovers. Yes, that’s right, even the five- year-old. My husband and I were children free-hence my 8:27 am eye opening. So you are now thinking: OOOH! A night with no children! What did they do?! Well, don’t hold your breath. We had no plans-because the 5-year-old’s sleepover was a very last minute, yet lovely, affair. So, we did what anyone would do; we watched the Olympics: the Women’s Curling Final- and then, the documentary The Cove. My husband is still, nearly 24 hours later, barely speaking to me! But, I digress! Back to this morning- both children needed to be picked up at 9 am; and so, with an 8:27 am wakeup, my morning was off with a bang. Once I had my over-tired, sleep deprived, children back, the day was doomed. The day did not disappoint. It was a wipe out. Both children were extraordinarily cranky-which made both adults in the house equally so. Something special needed to happen at mealtime. I decided that I needed to pull a rabbit out of a hat. We would have risotto. We needed risotto. So, I forgot- or made myself forget-just how much I hate making risotto. Risotto is not a hard dish to make-it just take patience. And, I must confess that I do not have much of that. 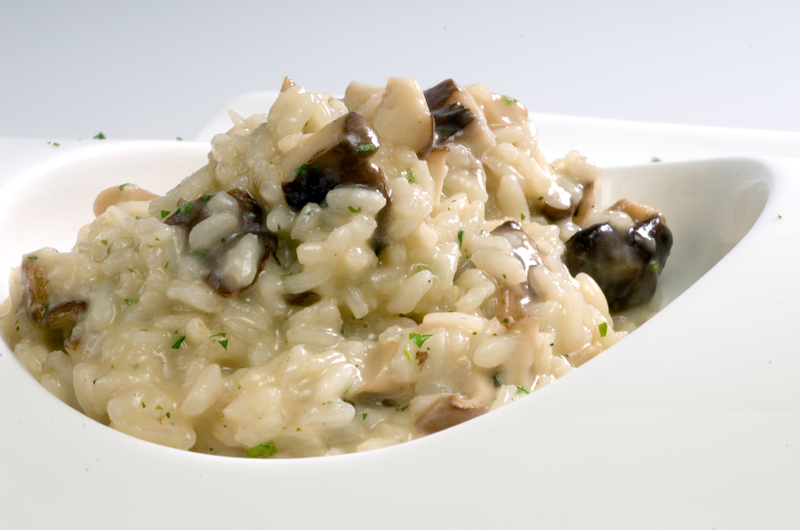 The trick to good risotto is simply stirring, constantly, while the rice absorbs the liquid. You just need to be prepared to stir and stir and stir-which I did. And, the results were wonderful. But, this is a dish that truly takes commitment. So, just know what you are getting into before embarking on this mission. That said, everyone was much happier after dinner! In a medium saucepan, bring stock to simmer over medium heat. Reduce heat to very low to keep hot. In a large saucepan, heat the oil and melt the butter over medium-high heat. Add the shallots and garlic and cook, stirring until soft, about 3 minutes. Add the mushrooms and cook, stirring, until wilted and their liquid is evaporated, about 5 minutes. Add the rice and cook, stirring constantly until the grains are opaque, about 2 minutes. Stir I the thyme. Add the wine and cook, stirring constantly, until nearly all evaporated. Add ¾ c. of the stock, the salt and pepper. Cook, stirring constantly, until the stock is nearly all evaporated. Continue adding more stock ½ c. at a time as the previous addition is nearly absorbed and until the rice is tender and the risotto is creamy -20-30 minutes. Stir in cream, cheese and parsley. Mix well. Remove from heat and adjust seasoning. Stir in truffle oil to taste. Serve immediately. This entry was written by Caroline, posted on February 27, 2010 at 10:32 pm, filed under comfort food, cooking, kid friendly, vegetarian. Bookmark the permalink. Follow any comments here with the RSS feed for this post. Post a comment or leave a trackback: Trackback URL. I admit that I have been afraid of tackling risotto. I don’t know why; it just sounds intimidating. But this sounded so tempting that I am going to have to give it a shot.